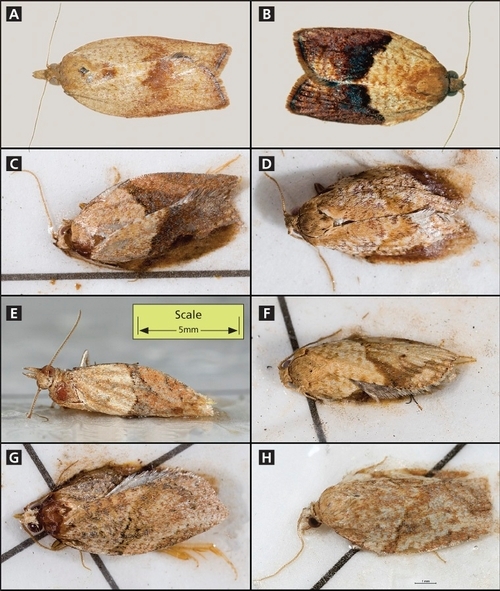 Light brown apple moth (Epiphyas postvittana) male (above, from California Agriculture 2008, vol 62: 57-61) and female (below, photo by Jack Kelly Clark). Origin and distribution: It is an invasive pest native of Australia, but has been present in Hawaii for more than a century. It was first found in Alameda County in 2007. It is now frequently found in Alameda, Contra Costa, Marin, Monterey, Napa, San Benito, San Francisco, San Mateo, Santa Clara, Santa Cruz, Solano, and Sonoma counties in California. It has also been detected in San Diego, San Luis Obispo, and Santa Barbara counties. Light brown apple moth larva and damage to the foliage. You can also see the silken webbing that attaches the leaves together. Photo by Jack Kelly Clark. LBAM eggs are laid in groups of 20-50 in overlapping manner and are covered with greenish transparent material. On average, females lay a total of 120-500 eggs in its life time. Eggs turn dark as they mature and hatch in 1-2 weeks. 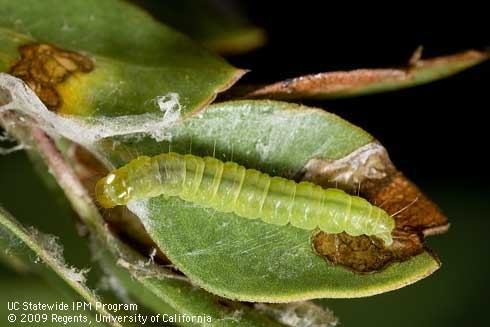 Larvae are pale to medium green with a yellowish to tan colored head capsule. 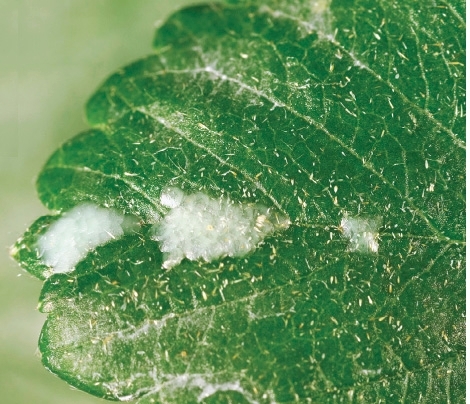 Younger larvae roll the leaves and form webbings of leaves as they mature. Mature larvae may also bore into fruits. Mature larvae are about 10-18 mm long. During winter, larvae can survive for two months without feeding. Pupae are formed in a silken cocoon among the leaf webbings. They turn from green to brown as they mature in 1-3 weeks. Adults mate right after they emerge and females lay eggs within 2-3 days after emergence. 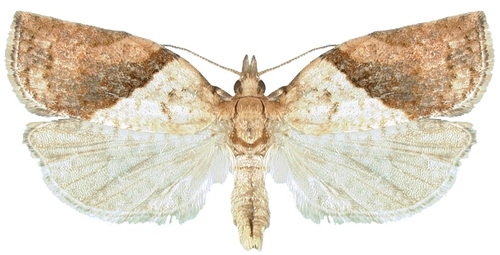 Adults are small, light brown with darker markings and have a wing span of 16-25 mm. They hold their wings in a roof-like pattern at rest. Markings on their wings can be highly variable and identification based on external features can be very difficult. Positive identification of LBAM adults often requires examination of reproductive organs. Females are lighter colored and larger than males. They rest in sheltered parts of the plant canopy during the day time and fly during the night time. They are not powerful flyers, so stay close to the infested areas within a 100 m (330 feet) range. Adults survive for 2-3 weeks. Depending on temperature, there can be two (Central and Noth Coast areas) or three to four (Central Valley and Southern California) generations per year in California. Management: Insecticides like insect growth regulators and spinosyns, biopesticides like Bacillus thuringiensis-based products, natural enemies that include predators and parasitoids are some management options. 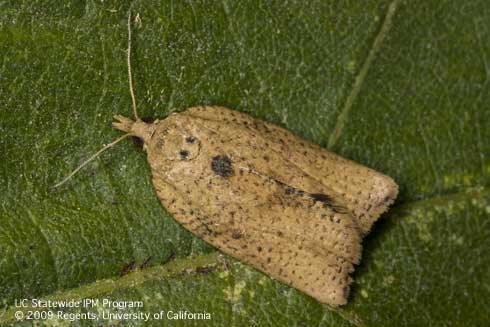 However, due to its current status in California, use of pheromone traps to cause mating disruption and quarantine practices to restrict movement are important components of current LBAM management. According to Guy Tingos, Deputy Ag Commissioner, Santa Barbara County, movement of nursery stock into Santa Barbara County from areas where LBAM is established must have a thorough inspection and LBAM certification to ensure the material is free of the pest. Movement of nursery stock, cut flowers, fruit or other plant material that can host LBAM out of quarantine area is highly regulated. Tingos also said that commercial farm operations in infested areas should be under compliance agreement for plant movement and public in quarantine areas should not move the host plants out of their property. For insect identification and information on quarantine regulations contact your local Ag Commissioner's office.